Beta Tauri is a blue giant star (1700 times brighter than the sun, 5 times as large), marking the tip of Taurus's northern horn. Seemingly part of the neighboring constellation of Auriga, El Nath was sometimes included therein as "Gamma Aurigae". 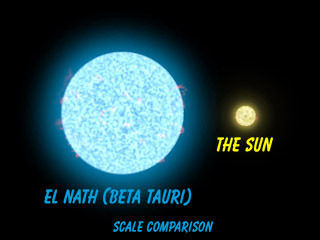 Anyway, today El Nath is strictly bull, and easy to find, as it is the second brightest star in Taurus and just shy of being "first magnitude".